It was an absolute pleasure for me to serve as your PTG president and to work with the other amazing women on the PTG board these past two years. 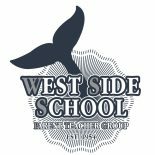 West Side School is a special place and I am a huge fan. I want to wish you all a very happy and safe Summer surrounded by love and all good things. See you in September! Congrats to our WS 6th graders moving up to the Jh/Sr High School. May you continue to work hard and strive to achieve the goals you have set for yourself. To those families leaving West Side, you will be missed! Thank you to all the parents who chaired or volunteered on a committee this year. If you chaired a committee, please remember to return your binder to the main office asap so we can prepare the binders for the upcoming year. Please continue to visit our website www.wssptg.com for updates, pictures, and announcements for the upcoming school year. Like us on Facebook. Camp Out: Thank you to Allison Monaco, Allison Standerwick, and their husbands, Craig and Christian, for chairing an amazing West Side Campout! We really appreciate all of their efforts to make it a safe and fun community event! Pizza Party: The PTG sponsored a year end pizza party for the entire school and we would like to thank the parents who helped serve the pizza: Melissa Newman, Jen Hennick, Andrea Mannino, Liza Davidian, Julie Starrett, Penny Koinis, Kerri Albers, Susan Kopp, Emily Moriarty, and Susan Goldstein. 6th Grade Graduation Party: Thank you to Sandra O’Grady and Melissa Newman for chairing the 6th grade graduation party and the committee members: Elise Jusko, Dana Lynch, Aviva Franz, Susan Rush, Michele Schmidt, Julie Gray, Sheri Donaldson, Natalia Milhim, Andrea Mannino, Stephanie Samuels, Alex McCauley, Kristyn Mulada, Joanne Parziale, Sara Cassacio and Lorianne Tyree. 6th Grade Moving Up: Thank you to Irena Dabakarov for ordering the 6th grade gifts and flowers for our students courtesy of the PTG, and for setting up the refreshments after the ceremony. Upcoming 6th grade parents: We are still in need of committee chairs for 6th grade graduation party and 6th grade get together. Please consider chairing one of these committees for next year. If you have any questions about these committees, reach out to Ana Shammah. This entry was posted on June 23, 2017 by wssptg in Brief.